Windows application for testing HDTV transport streams to make sure they are Mpeg2 compliant. 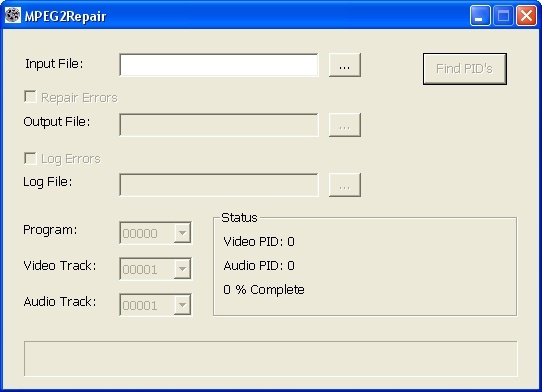 Find file errors resulting from signal drop-outs, faulty tapes, encoding errors, etc. Detection code checks transport layer for continuity errors and faulty headers. Code also checks the MPEG2 PES layer for parsing errors (corrupted macroblocks, slices, headers, etc.). All errors are logged with time stamps and file positions so you can easily locate them inside your original recording. Very useful for verifying files prior to permanent archiving. Automatically repair minor Mpeg2 transport and PES errors which may cause problems for certain decoders. Tool will remove erroneous data from the file by either cutting it out or replacing it with valid bits. The goal of repair is to create a fully Mpeg2 compliant file that will not crash, hang, or stall decoders which were not designed to deal with errors. Repair is currently not intended to improve the visual appearance of errors but simply to remove them. Automatically fix other issues that may affect decoder compatibility. These include partial GOP's, missing headers, incorrect continuity, etc. This feature is especially useful for those of you with old recordings from the 169time system. They should now play smoothly on other decoders besides the JVC 30K deck. Added "bad-edit" detection to show inconsistent telecine flags.Use "IgnoreFieldRepeatFlagWarnings" ini setting to disable. Added "ReadBufferSize" and "WriteBufferSize" ini settings. Might improve file i/o performance if you're not CPU limited. Improved performance of initial PID scan on slow wireless networks. Added "FileWildcard" ini setting to allow custom input/output file extensions. Added limited H.264 video support.Only scans for Transport/PES header errors.